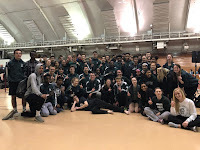 Saturday afternoon brought a close to the indoor season for the girls JMM Track & Field team as they competed at the 2014 Wisconsin TFA Championships. This meet brings in teams from around the entire state and is known as one of the most competitive meets during the entire indoor season. The girls got to go against some of the best to close out the end of the indoor season and it was a great experience for all the athletes who competed. Hopefully those at the meet learned something today from watching and competing against the best the state has to offer. Although the team did not score any points there were multiple athletes who had season bests and personal records in today's competition. Sydney S matched her PR in the high jump leaping 5' 0" putting her in a tie for 9th place. This jump also ranks Sydney as 17th in division 1 on the state honor roll. Kayla G had another great meet in the pole vault jumping 9' 0" earning her a 10th place finish. Her PR of 9' 3" last week puts her 3" away from being on the state honor roll. Amelia F improved in her 800m run with a PR of 2:35.77. The entire girls team will return to action on April 15th when they compete against Madison East to open the outdoor season. After a successful indoor season it is time to raise our goals and set our sights high for a big outdoor season. Work hard in the classroom, at the track, and in the weight room to make sure the remainder of the season is a huge success.